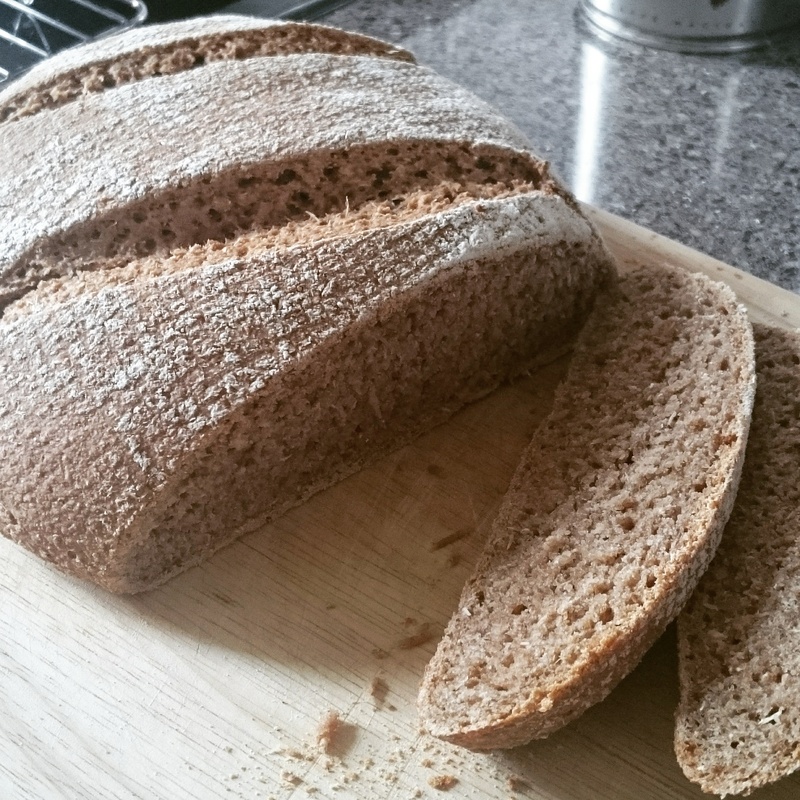 Victorian flour sourdough bread – first attempt. 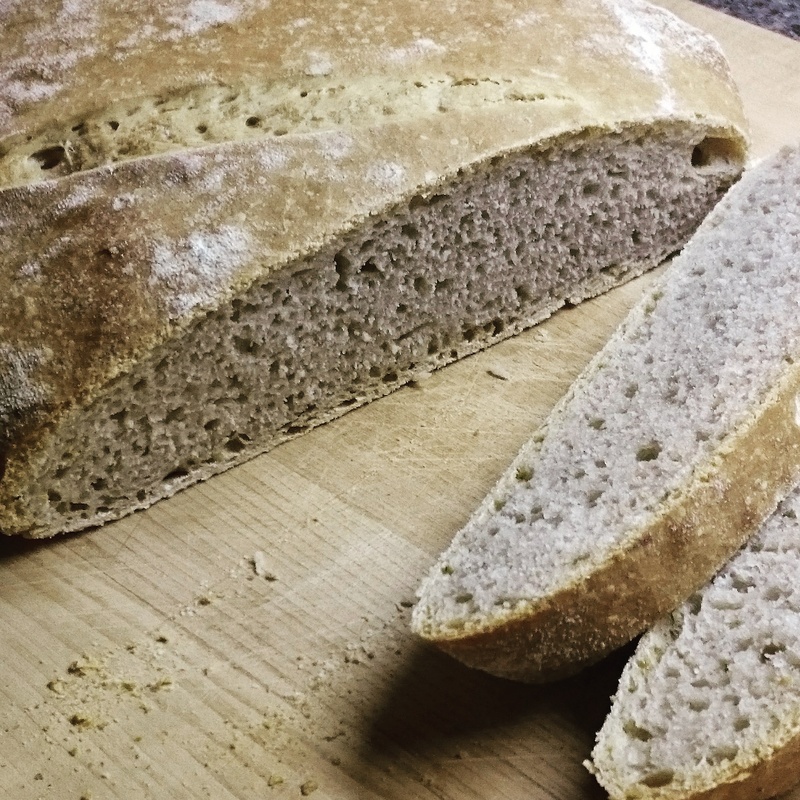 My previous experiments with sourdough bread sparked my interest in what other old varieties of wheat flour were available to try. Particularly those originating from, and grown in, the British Isles. It seems curious that while there has been a resurgence of interest in traditional varieties of many other food, wheat is still treated as an undefined commodity. The variety of wheat used to produce the flour is rarely mentioned, excepting the few ancient varieties of wheat like spelt of einkorn wheat that are still grown as specialty food crops. Through searching online for heritage British wheat flour I found Bakery Bits, with an online store selling a variety of baking ingredients including a fascinating range of traditional flours from a guy called John Letts under the brand Lammas Fayre. “Lammas Fayre flour by John Letts at Heritage Harvest is a very special range of heritage and ancient English organic flours available online exclusively from BakeryBits. The product of over a decade of sweat and academic rigour, John Letts has collected an extensive range of historically and botanically authentic cereals. All grown organically on farms in Buckinghamshire and Wiltshire, John grows them the traditional way, that is, in mixed populations (strains) that are well suited to local growing conditions. Modern cereals are grown one strain at a time and for huge, uniform yields. These cereals need to be mollycoddled since they cannot cope with variable climates, pests or diseases. Growing mixed populations, the traditional way, ensures that there is always a reasonable crop – and the ancient cereals are adapted to seek the nutrients they need from unfertilised soil: the modern strains need to be pampered with lots of fertilisers. 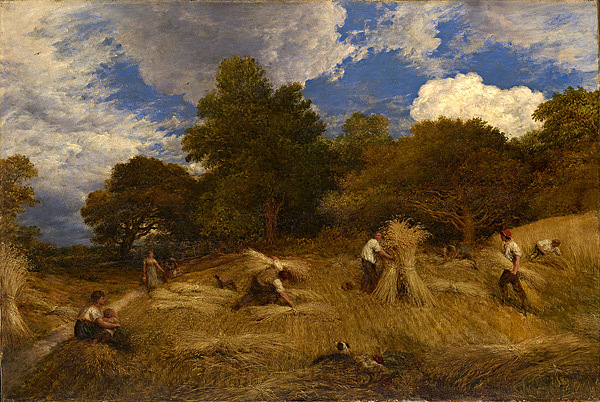 The flour that John makes from these cereals are rare (no one else has them) and in many cases, once gone, they will be unavailable until the following harvest. This resulted in my purchase of a range of the flours currently available. The first one I tried baking with was the Victorian Blend White Flour. This flour is smooth and very powdery to the touch due to the roller milling of some of the flour, a method that became common during the Victorian period. This time I decided to use some of the flour to make a sourdough starter of the same flour before baking, rather than using a rye starter, as I had previously done. My first attempt pictured above, produced an attractive but rather flat loaf, not helped by my forgetting about it and leaving it baking in the oven too long. The dough was rather runny, the same proportions as I used before seemed to contain too high a proportion of water. The second loaf I made with this flour reduced the amount of water added by 50 grams. 150 grams of starter – made of equal weight of Victorian flour and water. 250 grams of Victorian flour. 300 grams of Victorian flour. 10 grams of fine sea salt. 1 table spoon of olive oil. Otherwise the method of baking was the same as in my previous post. The addition of honey was on a whim, as I am generally rather a fan of honey, and it resulted in a very dark brown crust due to the added sugars. The second loaf using this recipe produced a stiffer dough and a loaf that rose higher. It would have produced a better looking loaf it I’d scored the dough more deeply when putting it into the oven. I’m looking forward to trying more of the heritage Lammas Fayre wheat flours. 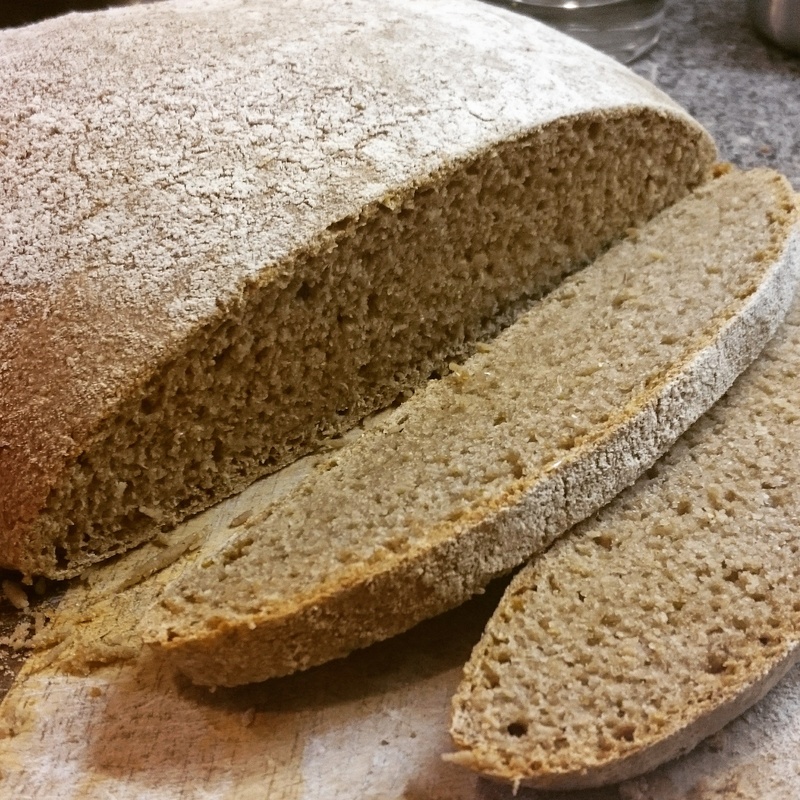 Victorian flour sourdough bread – second attempt. The wheat that we eat today has changed a great deal over the past century. The “Green Revolution“, the breeding of semi-dwarf, higher-yielding cultivars of wheat, and other cereal crops, has led to greatly increased grain production and crop yields since the mid-1960s. This undoubtedly contributed to the alleviation of global food shortages, however, modern plant breeding over the past sixty years has aimed for higher crop yields with little attention paid to the nutritional quality of the resulting cereal grains (Morris and Sands 2006). Increased yields of grain may have caused a reduction in the amounts of minerals in the grain, although this is difficult to test as the mineral contents can vary due to a wide range of factors including the plant variety, soil conditions, climate, and fertilizer treatment. A study in 2008 aimed to limit these variable factors with the use of historic stored wheat samples from the Broadbalk Wheat Experiment. Started in 1843 and continuing to the present day this fascinating experiment has occupied 5 hectares of rural Hertfordshire, divided in the parallel plots, and tested different fertilizers and manure treatments on the most popularly grown wheat varieties of the day. All the while recording rainfall, temperatures, and storing away wheat and soil samples each year. In some of these plots, acting as controls, have varied little in their fertilizer treatments since the beginnings of the experiment. Making use of these stored samples of grain, in their study in the Journal of Trace Elements in Medicine and Biology, Ming-Sheng Fan and her colleagues analysed the amounts of zinc, copper, iron, magnesium and phytate over the many years of the experiment. Figure 1. Trends in wheat grain yield (a), harvest index (b), Zn (zinc) (c), Fe (iron) (d), Cu (copper) (e), and Mg (magnesium) (f) concentrations in wheat grain from three plots of the Broadbalk Experiment since 1845. This could be due to the dilution effect, meaning that the grain is growing larger with the same mineral content, however the yields in Figure 1 suggest this is not the case. This shows that even in unfertilised wheat, where wheat yield did not increase, there was still the same drop in mineral content since the 1960s. Between 1988 and 1990 in the Broadbalk Experiment, an old tall variety of wheat called Squarehead’s Master was grown side-by-side with a modern semi-dwarf variety of wheat called Brimstone. This confirmed the previous trends as the Brimstone wheat had 18–29% lower concentrations of zinc, copper, iron and magnesium than Squarehead’s Master wheat. A common notion when discussing the nutrient content of modern food is that conventional farming causes a depletion of mineral nutrients in the soil, resulting in lower mineral concentrations in grain. To test for this the study authors measured stored soil samples from the past 160 years. Perhaps surprisingly they found that the concentrations of the minerals studied either remained the same or actually increased over the last 160 years. For sake of completeness they also measured the bioavailability of the minerals to the plants and found that the concentrations of bioavailable zinc, copper, and magnesium had all increased substantially over the last 160 years. The trends in the amount of phytate in the wheat was also measured as this is one of the best known modulators of mineral bioavailability in cereal grains. 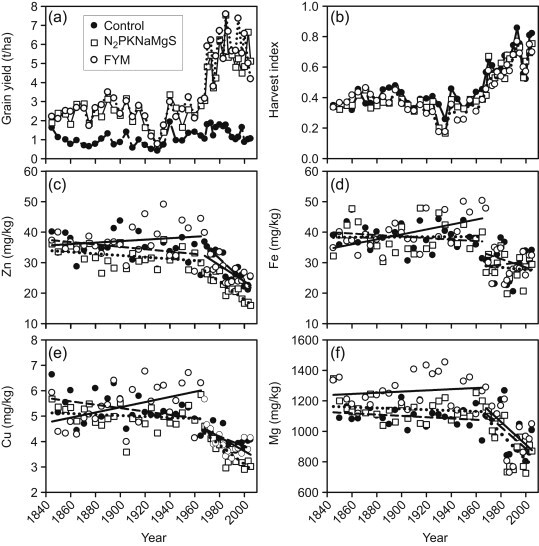 The ratio of phytate to minerals in the wheat declined over time. This means there was more phytate relative to the amount of minerals and suggests that those minerals may be less well absorbed. The reduced height (Rht) genes cause the wheat grow to a shorter height by making the wheat unresponsive to gibberellin, the equivalent of a plant growth hormone. Photosynthates are the sugars produced in the plant through photosynthesis, using energy from the sun. Growing shorter means less energy is needed for growth and more of those sugars are transported into the grain where they are formed into starch. The authors speculate that the faster rate of sugars being transported in the grain and the resulting faster starch accumulating in the grain is not matched by an increase in minerals transported through the plant. So the overall density of minerals is reduced. A limitation to this study was that only whole grain samples were analysed, as many people consume only refined white flour with much of the bran removed, where much the minerals are found. It would be interesting to know how much these decreases in mineral content has affected the minerals found in the starchy endosperm of the wheat, the part used to make white flour. Still, even if you eat whole grain wheat products, due to the use of modern high-yielding wheat cultivars, you are unlikely to be consuming the same amounts of minerals as you would have done eating wheat 100 years ago. 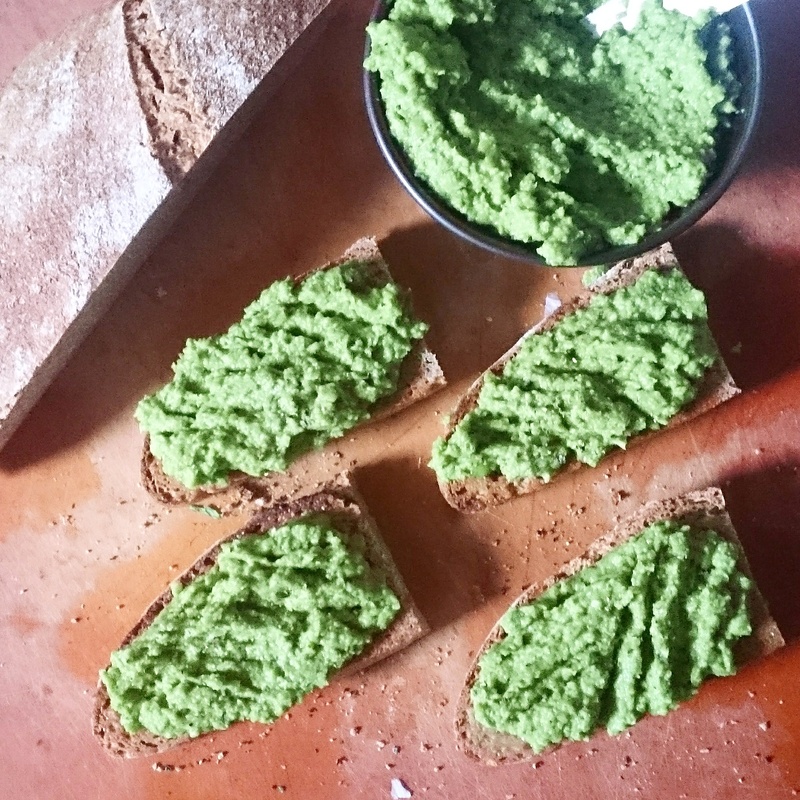 Pea purée on buttered wholemeal spelt sourdough bread. Few foods can match the vivid green of puréed frozen peas. The fresh taste of the peas combines beautifully with the mint an lemon to produce a very green flavour. Slices of toasted wholemeal spelt sourdough bread, lathered with a generous helping of butter, served as a fitting vehicle for these peas. The result was delicious and an excellent, sophisticated looking way of serving what is quite a simple meal of peas. An onion was sliced and sauteed in olive oil for a couple of minutes. A generous helping of garlic and frozen peas was added and sautéed for another few minutes until the peas are warmed through. The peas, onion, and garlic was placed in a food processor and the peas, lemon juice, lemon zest, salt, pepper , and mint leaves added in. The mixture was pulse mixed continuously until it is puréed but with some texture.Finally some extra mint leaves were blended in to taste. 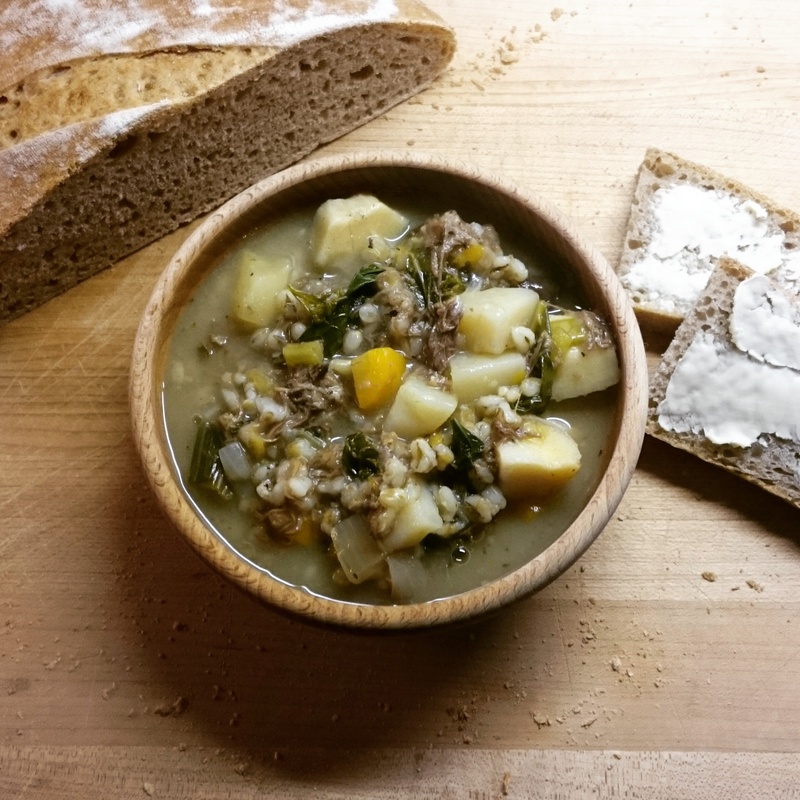 Wholemeal spelt sourdough bread with oxtail stew. I have never baked my own bread. This is despite having had a go at cooking many different things over the years and so recently I decided to rectify this omission. Given that I have an interest in fermenting foods and historic cooking techniques the obvious choice was to attempt some sourdough bread with a fermentation of wild yeasts and bacteria. This required both a starter and a method, as I had little knowledge on this subject. 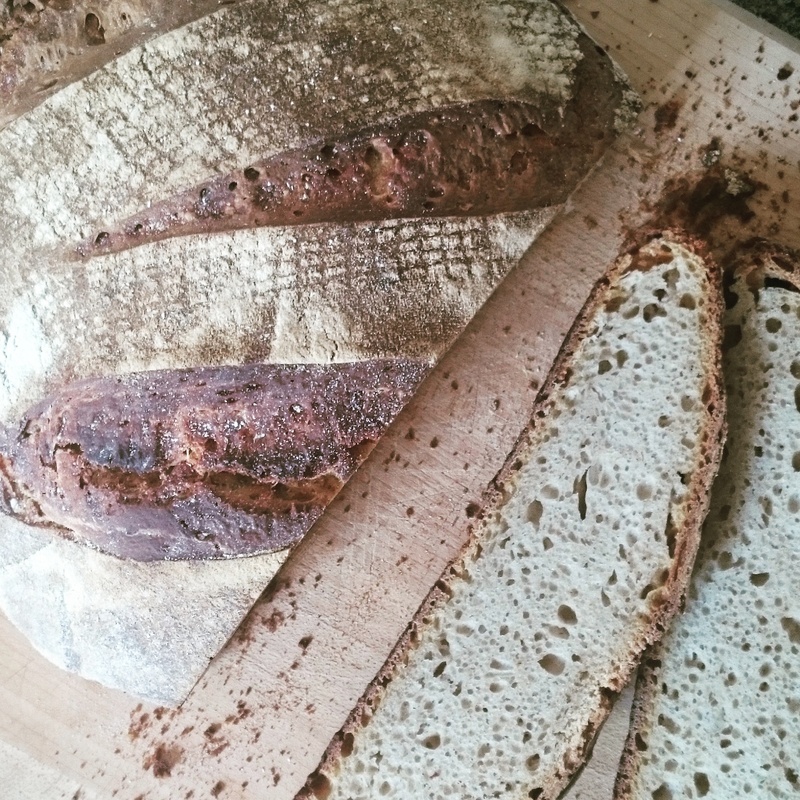 After searching around for recipes and becoming rather confused by the apparently many and various complicated methods for producing sourdough I stumbled upon an excellent article by Hugh Fearnley-Whittingstall in the Guardian newspaper. As usual Hugh manages to simplify the sometimes complicated subject of preparing real food and make it readily understandable. The first step was to make an active starter culture. I used Organic Wholemeal Rye Flour from Doves Farm to make the starter mixing together 100 grams of water and 100 grams of the flour in an open topped jar. The next day the same amount of flour and water were mixed in. Then each subsequent day the starter was halved and a fresh 100 grams of water and 100 grams of rye flour mixed in. The starter took a little while to get going but after a couple of weeks the culture was fermenting well and occasionally attempting to escape its jar. Once my starter was ready it was time to move onto the bread baking. My sourdough making is complicated by the rather cool temperatures of my old granite Scottish home. With room temperatures rather lower than is normal my bread would require longer fermentation times than many recipes suggest. Given my interest in the history of food and cooking I have so far chosen to try out a range of old varieties of wheat that I could get my hands on. 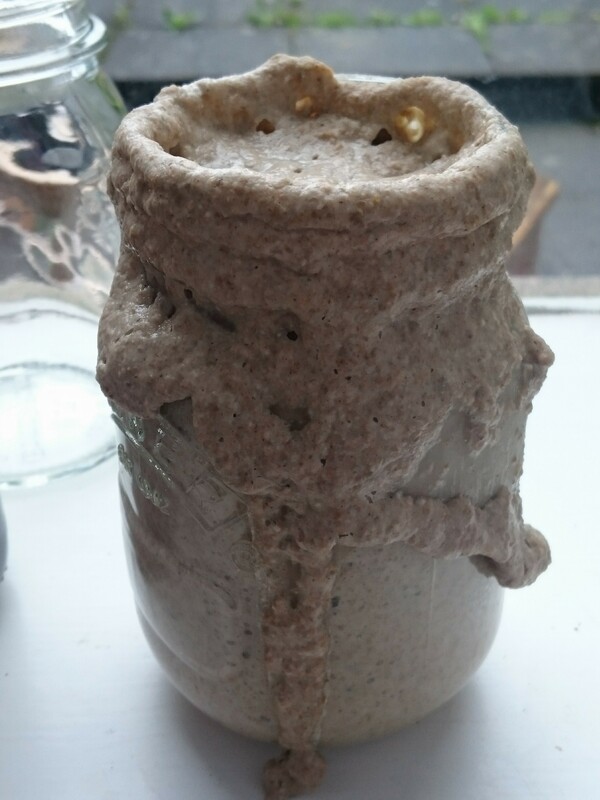 Active wholemeal rye flour sourdough starter. To cope with the cool temperatures, and the limitations of my being at work all day, I mixed the sponge in the evening after getting home from work. The sponge was fermented overnight for 12 hours, by which time it had risen well and was frothy with bubbles. In the morning I added in the salt, olive oil, and flour and mixed it into a dough. This was kneaded for 10 minutes and then placed in a greased bowl and covered in clingfilm. After about 10 hours proving, when home from work, I punched down the dough and placed in a bowl lined with a well floured tea towel. After about three hours proving again I heated the oven to 200C, sadly about he maximum my oven seems to reached judging my my oven thermometer, placing my cast iron bakestone in the oven preheat with a backing tray on the oven shelf below it. The dough was turned out onto the hot bakestone and boiling water poured into the backing tray. The bread was baked for 40 minutes, topping up the boiling water at 15 minutes to maintain the humid atmosphere. This first loaf worked out really well and the spelt flour produced an earthy rich flavour when combined with the sourdough fermentation. Sourdough number two – Spelt flour. 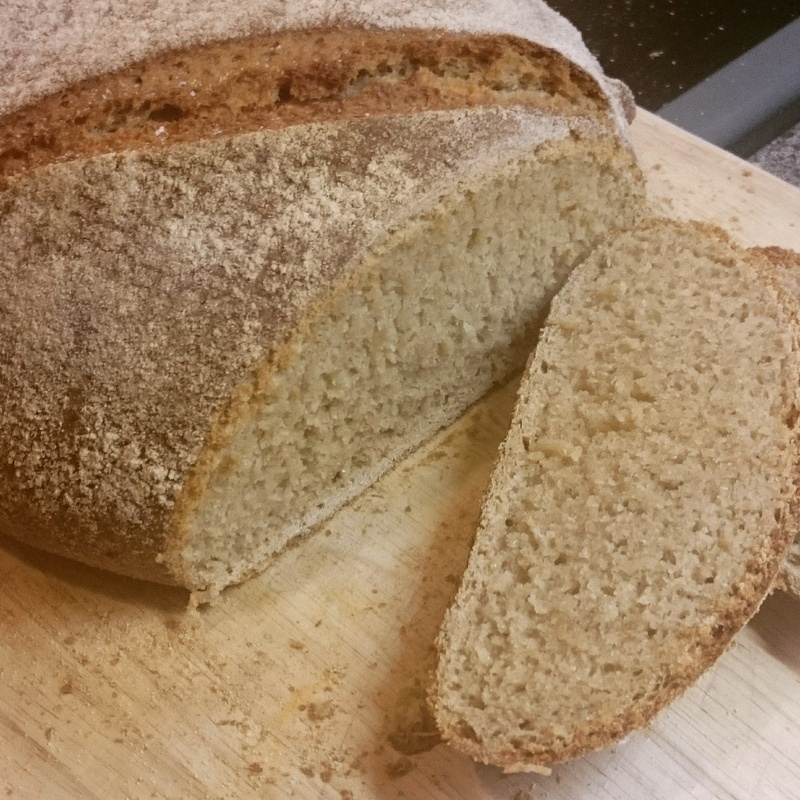 This second loaf was also made with Doves Farm Organic Wholemeal Spelt Flour. Again the method worked well with spelt and scoring the dough when placing it in the oven helped the bread rise a little more than before. Sourdough number three – Einkorn flour. Einkorn flour is the ancestor of all modern wheat, grown for many thousands of years since the beginnings of agriculture. The flour for this bread is Doves Farm Organic Einkorn Wholemeal Flour purchased from Real Foods in Edinburgh. Due to this it has a lower level of gluten than modern bread wheats, and the different structure of the gluten means it will never rise like a modern bread loaf. However, this current method I’m using produced a good loaf, equal in structure and shape to the spelt flour loaves. 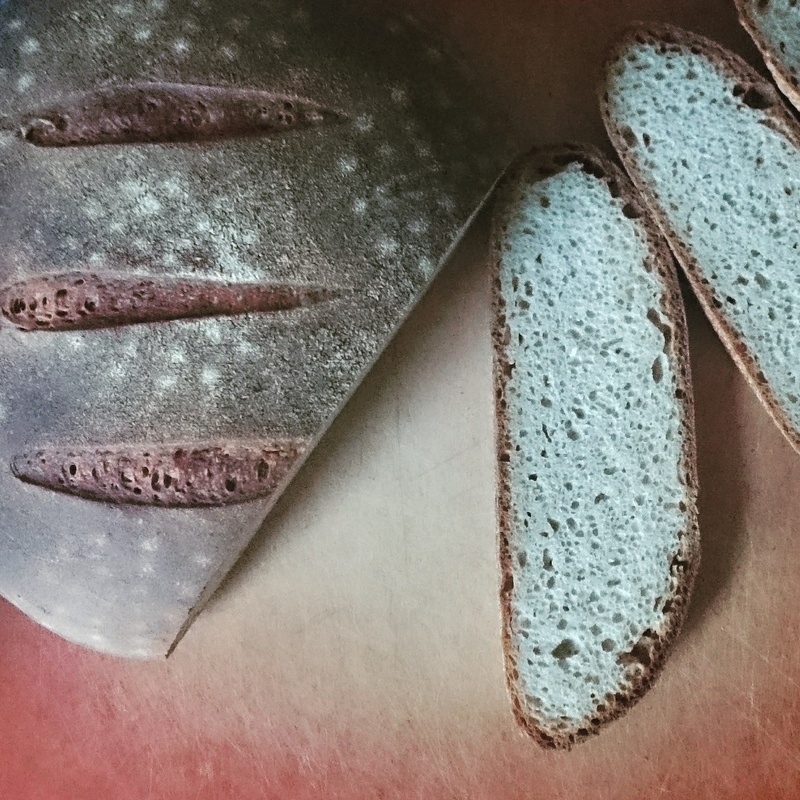 The flavour of einkorn in this bread is very distinctive, imparting a mild, almost nutty taste to the bread. This einkorn flour is also produced quite a pale light coloured loaf despite being wholemeal and the bran it contains much be light in colour. Sourdough number four – Khorasan (Kamut) flour. For this loaf I used another ancient flour known as Khorasan, or Kamut, flour named after in the Khorasan region of Iran. This Doves Farm Organic Khorasan Wholemeal Flour was again found at Real Foods store in Edinburgh. Using the same method this flour produced a great tasting loaf, pale in colour and with a rich flavour all of its own. 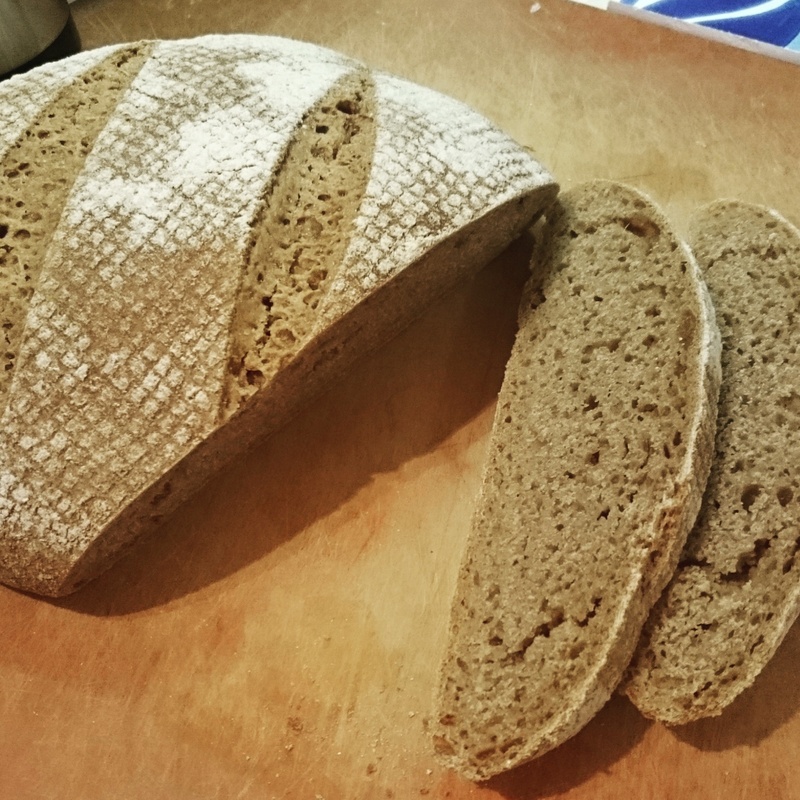 Sourdough number five – white spelt flour. A new recent find in Aberdeen was some Doves Farm White Spelt Flour at the Grampian Health Food Store. This white flour had a lighter flavour due to the reduced bran, with a slightly more open texture to the bread. This foray into bread baking has definitely stimulated my interest in the process of baking bread and sourdough fermentation. This method from Hugh Fearnley-Whittingstall has so far worked really well around the times I have available during the week and the cool temperatures in my home that require long proving times. In contrast today, on the prairies of the midwest or the fields of England, the wheat is unlikely to be so tall or waving in such a poetic manner. The wheat grown today is rather shorter and stockier, with stronger stems. This is a result of wheat breeding over the past hundred years to increase the yield of wheat by reducing plant height and make the plants resistant to lodging in conditions of intensive agriculture. Wheat breeders developed plants with shorter and stiffer straws, producing semi-dwarf, high-yielding varieties that were much better adapted to intensive agriculture. Before this time the traditional varieties of wheat grown were limited in the yield they could produce as adding more fertiliser resulted in the wheat stalks growing taller and weaker making them vulnerable to breaking. The modern semi-dwarf varieties of wheat have recently come into public attention due to the publication of popular diet books blaming these new types of wheat for a plethora of modern health problems. However, rather than these alleged health issues, I was interested to know where these semi-dwarf wheats came from and the origin of the genes responsible. In an interesting article from 2005, Katarina and Ksenija Borojevic outline the history of the genes responsible for our modern dwarf wheat, with more of a focus on Europe, rather than the better known efforts in America that resulted in the Green Revolution. The story starts further back than you might imagine, and to Korea, where naturally occurring short stemed wheat varieties were grown as far back as the third and fourth centuries A.D. The genes responsible were natural mutations rather than a production of any human intervention. These short varieties of wheat found there way to Japan as a result of the Korean-Japanese War during the sixteenth century. Semi-dwarf wheat varieties were widely grown in Japan by the 19th Century and served to provide the dwarfing genes for all our modern wheat varieties now grown around the world. The variety Akakomugi, a 19th Century Japanese landrace of semi-dwarf wheat, provided the dwarfing genes first transferred to Europe in the early 20th Century. The Italian wheat breeder Nazareno Strampelli was to use this Japanese wheat, crossing Akakomugi with an Italian wheat by 1913 to produce a new shorter, lodging resistant Italians wheat. By 1918 a number of new semi-dwarf wheat varieties had been developed from this initial hybridisation which soon became very well known and were grown in Italy and South America, particularly in Argentina. By 1931 Nazareno Strampelli, using further hybridisations, had produced another improved variety called San Pastore that proved to be an extraordinary success and was widely grown in Italy and many other countries for more than 35 years. These wheat breeding initiatives were supported and encouraged by the Italian government as they coincided with a drive for Italy to be self sufficient in food. This was known, as occurred during Mussolini’s time, as the Battle for Grain. These new semi-dwarf wheat hybrids enabled Italy to double its cereal production from 1922 to 1939 and and to become more or less self-sufficient in cereal production, where previously they had been heavily reliant on foreign imports. After World War II, the Yugoslav government was also keen to encourage national self sufficiency and imported dwarf Italian wheat varieties during the 1950’s. These were widely grown, and through hybridisation with local wheats, enabled the development of new high-yielding winter wheat that were grown on a large-scale. Average yields increased from 1.36 tons of wheat per hectare up to 5.21 tones per hectare. Neighbouring countries including Hungary, Bulgaria, Romania, the former Czechoslovakia obtained similar results. The gene responsible for reduced height originating in the Japanese Akakomugi wheat is known as Rht8 (abbreviated for reduced height 8). The function of this gene is still not clear but has been suggested to reduce sensitivity to brassinosteroids, a class of plant hormones that promote stem elongation and cell division. The identity of this Rht8 gene was only discovered at the end of the 20th Century and has been shown to have contributed its semi-dwarf characteristics of wheat across South Central Europe and the former USSR. Semi-dwarf wheat reached the Americas via a completely separate route and through unrelated genes. Japanese wheat breeders, continuing their work on reduced height wheat, produced a new variety in 1932 that became known as Norin 10. This was produced by crossing an old Japanese dwarf landrace wheat called Daruma with American wheat varieties. Norin 10 grew to just two feet tall, instead of the usual four. Norin 10 was never an important variety in Japan but found its way to the USA due to the occupying US army after the Second World War. S. D. Salmon, a scientist working on wheat research with the U.S. Department of Agriculture (USDA) was serving as an advisor of the occupation army when he made a visit to the Marioka Agriculture Research Station on Honshu in Japan. He returned to the US, with wheat samples, given by Japanese scientists during his visit, Norin 10 was among these samples. The genes making Norin 10 a short wheat are the Rht1 and Rht2 genes that make the wheat plant insensitive to another type of plant growth hormones called gibberellins. In 1952, an agronomist working at Washington State University called O. A.Vogel used this Norin 10 to cross with a popular wheat variety grown in Washington at the time. The resulting variety called Gaines became the predominant wheat variety in the Pacific Northwest in the late 1960s with farmers producing record wheat yields. It was from Washington State that Norin 10 was acquired by Norman Bourlag at the International Maize and Wheat Improvement Center (CIMMYT) in Mexico where new dwarf wheat varieties were developed and later spread around the world, resulting in the Green Revolution and earning Norman Bourlag the 1970 Nobel Peace Prize. Adding the dwarfing genes in Norin 10 to their wheat breeding enabled the development of high yielding wheat varieties that could stand high levels of added fertiliser. These varieties developed at the CIMMYT dramatically increased wheat yields around the world, first enabling Mexico to become self sufficient in wheat and later countries like India and Pakistan. It is clear the genes responsible for dwarfism in wheat plants have a long history and a complex route has taken them from ancient Korea into modern wheat plants in Europe and the rest of the world. While the work North America and the green revolution has attracted most of the attention, in Europe at least, genes introduced in the early 20th Century have also been important in the development of of modern wheat. It is also interesting that parts of Europe have been eating semi-dwarf hybrid wheat since the 1920s. Whatever the alleged health implications of these modern wheat varieties, the genes that make make them shorter have a long history and appeared spontaneously long before the work of modern genetics and crop manipulation. Borojevic K. and Borojevic K. (2005) The Transfer and History of “Reduced Height Genes” (Rht) in Wheat from Japan to Europe. Journal of Heredity. 96(4):455-459. 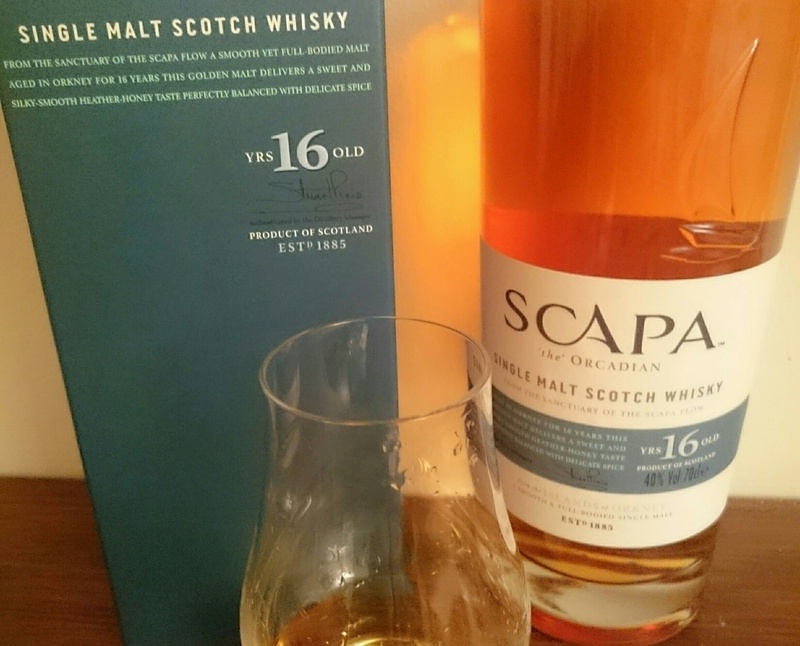 In a recent post I looked into the science behind the phenolic compounds found in my favorite Scottish malt whiskies, and extracted into said water of life via the action of alcohol and water on the wood of the oak barrels they are aged within. I realise this was quite neglectful of the fact that a range of other distilled spirits undergo barrel aging to produce their unique characteristics. Thankfully science has not been so negligent on this topic and a study from 1999 in the Journal of Agricultural and Food Chemistry investigated this very subject. The graph shows the mean total antioxidant status (mmol/L) of distilled spirits analysed by Goldberg et al in their 1999 study. This study analysed both the total antioxidant capacity and the amounts of a range of phenolic and furan compounds. This included both a single malt scotch whisky and a blended whisky, although unfortunately for comparison with my previous post they do not mention the age of this whisky. Judging from the amount of ellagic acid in the table below it could be suggested to be a 10-12 year old single malt. Of more interest here is that the study also included an American bourbon, French brandy and Armagnac. This study included a few different compounds found in barrel aged spirits. The structures of these are shown below, illustrating the complexity of compounds that develop during the aging process. Structural formulas of the main compounds mentioned. Perhaps also the use of freshly made oak barrels increases the transfer of phenolic compounds into bourbon, as compared to Scotch whisky which reuses previously used barrels. Vanillic Acid, Syringaldehyde were found in the highest amounts in bourbon. The lower levels identified in the Canadian rye whisky are mostly likely to a much shorter duration of barrel ageing. The quantities of six polyphenols in the various spirits tested. The striking feature of this study is the high amounts of all phenolic compounds in Armagnac, which had by far the highest concentrations of gallic acid, syringic acid, vanillin, and ellagic acid, as well as the second highest of vanillic acid, syringaldehyde, coniferaldehyde, and trimethoxyphenylacetic acid. This is possibly due to the exacting and protected methods used to produce Armagnac, of which wood aging of up to 10 years in Limousin oak for cognac and black Monlezun oak, a “black oak” from the Monlezun forest in Gascony, for armagnac, is a notable feature. Of interested, the ellagic acid found in both whiskies and Armagnac, is also proposed to be responsible for some of the health benefits of fruits such as blackberries, cranberries, pomegranates,raspberries, which are the main source of ellagic acid in the diet. However, the amounts in even Armagnac are rather low in comparison. While the evidence from my previous post showed that long aged Scottish malt whisky, aged 25 years, had a much higher level of phenolic compounds than any in this study, the age of Scotch malt whisky at which most people drink it may not quite reach the levels of phenolics found in American bourbon, and is probably rather inferior to Armagnac. As the phenolic compounds extracted from oak wood during the aging of alcohol are common to all aged spirits, any health effects mentioned in my previous post would apply to all. However, it is worth remembering any possible health benefit is going to be redundant if consumed in large quantities. *Any spelling mistakes in the post are due to the influence of good whisky. Oats are one of the quintessential foods of the traditional Scottish diet. In terms of health benefits they are best known for their fibre content, particularly their beta-glucan content. Less well known is that this humble grain contains a unique class of more than twenty polyphenols known as avenanthramides, not found in any other foods. In recent years evidence has been emerging that these avenanthramides potentially have a wide range of beneficial effects on our health. As well as being a staple food in Scotland and other regions of northern Europe, oats also have a long history in medicine. They have been used to treat various conditions such insomnia, anxiety, and skin conditions, including eczema, and burns in various forms such as food, tea, or in baths. The use of wild oats (Avena sativa) has apparently been recorded for use in skin care as far back as 2000 BCE in Egypt and the Arabian peninsula and various skin conditions were often treated with oatmeal baths in the 19th and early 20th centuries. In 1989 the FDA recognised colloidal oatmeal as a safe and effective over the counter skin protectant drug and later in 2003 it was approved as an ingredient to be used as a skin protectant, one of the few botanical ingredients considered an effective skin protectant (Kurtz and Wallo 2007). Until comparatively recently little thought had been given to the compounds in oats responsible for these anti-inflammatory activities of oats until the discoverly of avenanthramides in the late 1980’s (Collins 1989). These avenanthramides are a unique, group of soluble phenolic compounds which are not present in other cereal grains. These compounds are antipathogens (phytoalexins), meaning they are produced by the plant in to defend against plant pathogens such as fungi. While more than 20 different forms of avenanthramides are present in oats, three of these known as A, B, and C, make up the majority (Meydani 2009). These avenanthramides are now considered to form the active ingredients in oats responsible for their beneficial effects when applied to the skin. 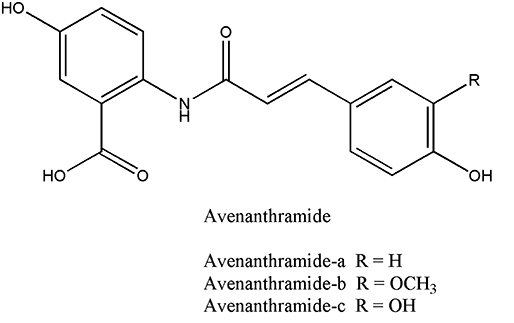 Beyond the skin evidence is also emerging that these avenanthramides can have a range of beneficial effects within the body (Meydani 2009) . They have potent antioxidant properties potentially preventing the oxidation of cholesterol transporting low-density lipoproteins, at least in the lab (Chen 2004). Their anti-inflammatory effects may be able to help reduce inflammation in the cells lining our arteries (Liu 2004). Another interesting biological effect of avenanthramides is on nitric oxide (NO)-dependent vasodilation, a process that relaxes blood vessels leading to better circulation and reduced blood pressure (Nie 2006). Avenanthramides in very low concentrations have been shown to reduce inflammatory responses in skin cells and so mediate the anti-itch properties of oats when used on the skin, indicating that very little avenanthramides may be required to produce an effect (Sur 2008). Avenanthramides have been shown to be bioavailable in humans, being absorbed into the circulation, and to increase the antioxidant capacity of the blood in healthy older adults when fed enriched enriched oat products (Chen 2007). Even avenanthramides that are not absorbed could have an beneficial effects in our gut, given their anti-inflammatory effects when applied to the skin, this is speculative though. Little information is currently available on the concentration of these avenanthramides present the oats used for our food, or the various oat products produced from them. One study that investigated the effects of processing on oats found that the avenanthramides content was much reduced in rolled oats, due to the effects of drum drying (Bryngelsson 2002). Rolled oats are steamed before being rolled flat, and require drying afterwards to remove the moisture added during the steaming process. The same study found that similar treatments to oatmeal, oats that had been heated and then then ground, had little on the avenanthramide content (Bryngelsson 2002). An earlier study found that the avenanthramides in products with added oatmeal such as bread, fresh pasta, muffins, and macaroni, survived well into the final products and end had an increase in free avenanthramides (Dimberg 2001). The amounts of avenanthramides can vary between different varieties of oats and survive storage and heating quite well (Dimberg 1996). A new method has even been proposed, using a process of “false malting” wherein selected or pre-treated grain is conventionally malted but does not germinate, that can dramatically increase the avenanthramide content of oats (Collins 2010). This suggests that the avenanthramides in the oats do survive into the food we eat, although there are still many unknowns about all the effects of oat varieties and processing techniques. While little research has been carried out on the influence of avenanthramides in the amounts found in the oats we eat, they are an interesting group of compounds that potentially provide some extra benefits to eating oats and contribute to the healthfulness of oats as a part of the diet. Bryngelsson, S. et al. (2002) Effects of commercial processing on levels of antioxidants in oats (Avena sativa L.). Journal of Agricultural and Food Chemistry. 50:1890–1896. Collins, FW. (2010) Avenanthramides in oats: A new method of producing whole oats and oat ingredients with greatly elevated avenanthramide levels. Online. AACC International Cereal Science Knowledge Database. Dimberg, LH. et al. (1996) Variation in Oat Groats Due to Variety, Storage and Heat Treatment. I: Phenolic Compounds. Journal of Cereal Science. 24(3):263–272. Kurtz ES and Wallo W. (2007) Colloidal oatmeal: history, chemistry and clinical properties. Journal of Durgs in Dermatology. 6(2):167-70. Nie L. et al (2006) Avenanthramide, a polyphenol from oats, inhibits vascular smooth muscle cell proliferation and enhances nitric oxide production. Atherosclerosis. 186:260–266. Scottish malt whisky, unlike other beverages such as red wine, tea or coffee, has received little attention with regards to its phenolic plant phytochemicals. In the production of malt whisky the pure distilled spirit is aged in oak barrels for a number of years. During this aging constituents that make up the wood gradually dissolve into the spirit determining its flavour, colour and taste (Tanaka 2010). The wood of American white oak used to make many of the barrels used to age whisky contains significant amounts of an oak wood polyphenols called ellagitannins. The processing stages of making barrel for whisky production, including seasoning and toasting, results in various chemical changes in the ellagitannins of the wood resulting in the phenolic compounds in the whisky being rather different than the original oak wood polyphenols (Cadahia 2001). The original tannins decompose during toasting or charring of the barrels and then during the aging process oxygen molecules are absorbed through the wood further oxidising the dissolved phenolic compounds. The polyphenols in whisky are a mixture of products resulting from a complex chemical process (Tanaka 2010). These non-volatile components of whisky are known are whisky congeners, they are not found in the freshly distilled spirit but rather are a result of the long aging of good whisky. A range of these phenolic compounds were isolated from commercially bottled Japanese whisky including carboxyl ellagic acid, gallic acid, ellagic acid, brevifolin carboxylic acid, among others (Fujieda 2008). In another study ellagic acid, gallic acid, and lyoniresinol were found to be the principle polyphenols in a range of whiskies of both Japanese and Scottish origin. However, these three compounds only made up 20% of the antioxidant capacity of the whisky tested, suggesting there are a range of other polyphenols involved (Koga 2007). Levels of gallic acid, ellagic acid, and lyoniresinol in whisky of different ages (Fujieda 2008). Unlike other popular beverages whisky has been rather lacking in study regarding the potential effects of these plant phytochemicals when ingested by humans. One of the few studies on the subject, carried out at my own Rowett Institute, examined the concentration of phenolic compounds and antioxidant capacity of volunteers blood after drinking 100 millilitres, (3.5 ounces) of either red wine, a 12 y old malt whisky which had been matured in oak wood casks, or a `new make’ whisky which is the newly-distilled whisky spirit prior to maturation. Surely one of the more arduous nutrition studies ever carried out (Duthie et al. 1998). Concentration of total phenols in volunteers blood after drinking whisky or red wine (Duthie 1998). Both the whisky and red wine produced a similar rise in total phenols in the blood of volunteers, suggesting the phenolic compounds in whisky are rapidly absorbed after drinking. The ‘new make’ whisky did not cause any rise in blood phenols. Although the levels in the blood were similar between red wine and whisky, in fact proportionately more of the phenolic compounds were absorbed from the whisky than the wine. This may be due to the higher alcohol content enhancing their absorption, and different bioavailability of the compounds in wine and whisky. New made whisky did not result in any increase in phenols in the volunteers’ blood (Duthie et al. 1998). Antioxidant capacity of volunteers blood after drinking whisky or red wine (Duthie 1998). Drinking whisky or red wine increase the antioxidant capacity of the volunteers’ blood to a similar degree. Unexpectedly the ‘new make’ whisky caused a decrease in antioxidant capacity of the blood, possibly due to increased oxidative stress caused by the alcohol itself, or as suggested by the authors, the greater content of copper in the ‘new make’ whisky. This suggested that the phenolic compounds in whisky are absorbed and can influence the antioxidant capacity of the blood in a similar way to red wine, and that the aging process of whisky in oak barrels in key to these effects. The phenolic compounds in whisky appear to be absorbed into the blood and a few small studies from Japan now hint at what effects these compounds may have in the body. 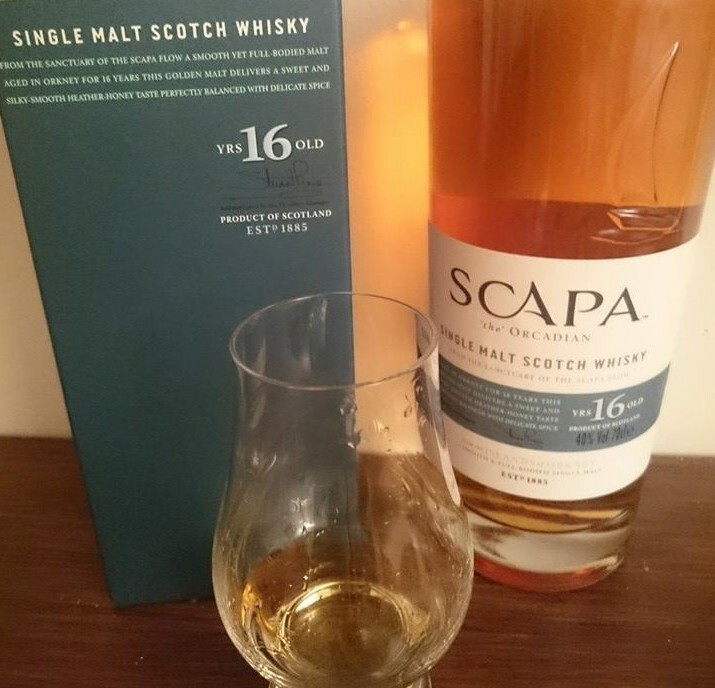 Single malt whisky showed the ability to neutralise free radicals and there was a positive correlation between this activity and the how long the whisky had been aged (Koga 2007). This antioxidant ability of whisky has been found to protect E. coli bacteria from oxidative damage caused by hydrogen peroxide, compared to the same amount of pure alcohol (Aoshima 2004). The specific compounds isolated from whisky have been shown to have a range of interesting effects. Isolated whisky phenolic compounds including ellagic acids suppressed allergic reactions to allergens in both isolated cells and in mice. These findings suggest that the phenolic compounds from whisky seemed to be beneficial to ameliorate allergic reactions (Itoh 2010). The isolated phenolic compounds from whisky were found to reduce the inflammation in isolated immune cells and in mice. These whisky phenolic compounds may be beneficial for the treatment of inflammatory disease (Itoh 2012). Ellagic acid prevented alcohol induced development of fatty liver in mice, although these were higher doses than found in whisky. These results provide a molecular basis for the prevention of alcohol-induced stress by the polyphenols in alcoholic beverages (Yao 2014). In human epithelial cells, the cells that line the blood vessels of the body, the activity of the enzyme heme oxygenase-1 was increased by the phenolic compounds isolated from whisky. This effect only emerged in whisky aged in oak barrels. This heme oxygenase-1 enzyme is thought to protect the lining of the blood vessels from damage. Various epidemiological reports suggest a moderate consumption of alcoholic beverages appears to reduce some health risks in relation to human health. The, up-regulation of this enzyme in the cells lining the blood vessels by whisky might possibly contribute to the maintenance of blood vessel function (Suzuki 2010). These effects are interesting but should however be taken with some caution as the relevance of the potential effects, in the concentrations found in whisky, are unknown to human health. The phenolic compound ellagic acid may have a direct effect in the gut ameliorating some of the harmful effects of alcohol on the lining of the gut. It has been shown that whisky is less irritating to the delicate lining of the gut, as compared with pure ethanol. 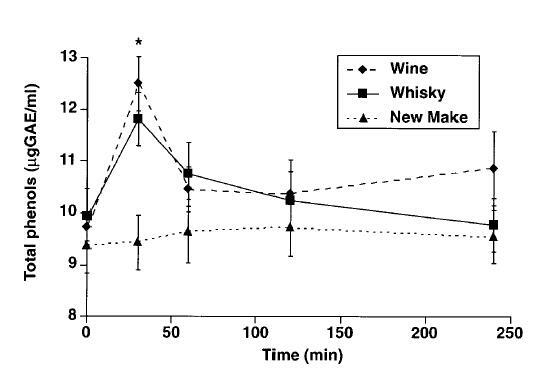 This effect of whisky may be explained by ellagic acid, one of major polyphenols contained in whisky, and its radical scavenging action (Iino 2001). A later study confirmed that ellagic acid is able to directly protect the lining of the gut from damage and explains the less damaging effect of whisky on the stomach than pure alcohol (Iino 2002). This is hardly to suggest that whisky is good for the gut, but at least its potential negative effects are mitigated by its polyphenols compared to pure alcohol. The effect of whisky of uric acid levels in the blood has also been investigated. Alcohol generally increases the level of uric acid in the blood, both by increasing the production of uric acid in the liver and reducing how much is excreted in urine. This a concern for people with high blood uric acid levels who are at risk of gout, for which alcohol consumption is an important risk factor. However, unlike other alcoholic drinks, it has been found that whisky tended to lower the levels of uric acid in the blood (Nishioka 2002). This tendency was suggested to be partly due to the inhibition of xanthine oxidase, the enzyme that produces uric acid. The longer the whisky had been aged in oak casks the greater effect it had on reducing the activity of the xanthine oxidase enzyme. It was also found that whisky stimulated an increase in the amount of uric acid excreted in the urine by 27%. This improved excretion of uric acid seemed to be mainly responsible for the reduced uric acid after drinking whisky and showed that at a moderate level of drinking, whisky have different effects on uric acid than other types of alcohol (Nishioka 2002). More recently it has been suggested that the decreased serum urate level after whisky consumption may be mainly due to inhibition the uric acid transporters in the kidneys by the phenolic congeners in whisky. This would result in more uric acid being lost into the urine (Lu 2014). While this may make whisky a better choice than other drinks to those with high blood uric acid levels or gout who wish to drink alcohol, caution should be applied, as the research on this subject is rather limited. While these phenolic compounds may be appearing rather good now, there is a possible downside to their presence in whisky. Some older research (Damrau 1960), suggests that the same whisky congeners absorbed from the oat barrels can slow the metabolism of alcohol. This could explain the increased hangover symptoms reported by volunteers in the study, at least in comparison to vodka. It does maybe provide an excuse for the purchase of an older, longer matured, fine malt whisky. Perhaps be cautious with drinking to excess, as those very same compounds may increasing any resulting hangover. Conflicts of interest: I do rather like good whisky. Aoshima, H., Tsunoue, H., Koda, H. & Kiso, Y. 2004, “Aging of whiskey increases 1,1-diphenyl-2-picrylhydrazyl radical scavenging activity“, Journal of Agricultural and Food Chemistry, vol. 52, no. 16, pp. 5240-5244. Cadahia, E., Varea, S., Munoz, L., de Simon, B. & Garcia-Vallejo, M. 2001, “Evolution of ellagitannins in Spanish, French, and American oak woods during natural seasoning and toasting“, Journal of Agricultural and Food Chemistry, vol. 49, no. 8, pp. 3677-3684. Damrau, F.,Liddy, E. 1960, “Hangovers and Whisky Congeners: Comparison of Whisky with Vodka“, Journal of the National Medical Association, vol. 52, no. 4, pp. 262–265. 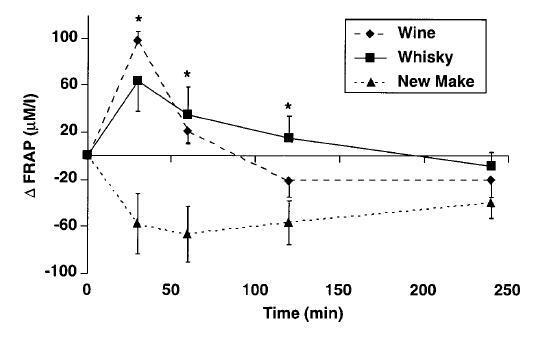 Duthie, G., Pedersen, M., Gardner, P., Morrice, P., Jenkinson, A., McPhail, D. & Steele, G. 1998, “The effect of whisky and wine consumption on total phenol content and antioxidant capacity of plasma from healthy volunteers“, European Journal of Clinical Nutrition, vol. 52, no. 10, pp. 733-736. “OBJECTIVE: To assess whether consumption of 100 ml of whisky or red wine by healthy male subjects increased plasma total phenol content and antioxidant capacity. DESIGN: A Latin square arrangement to eliminate ordering effects whereby, after an overnight fast, nine volunteers consumed 100 ml of red wine, malt whisky or unmatured ‘new make’ spirit. Each volunteer participated on three occasions one week apart, consuming one of the beverages each time. Blood samples were obtained from the anticubital vein at intervals up to 4h after consumption of the beverages when a urine sample was also obtained. RESULTS: Within 30 min of consumption of the wine and whisky, there was a similar and significant increase in plasma total phenol content and antioxidant capacity as determined by the ferric reducing capacity of plasma (FRAP). No changes were observed following consumption of ‘new make’ spirit. Fujieda, M., Tanaka, T., Suwa, Y., Koshimizu, S. & Kouno, I. 2008, “Isolation and structure of whiskey polyphenols produced by oxidation of oak wood ellagitannins“, Journal of Agricultural and Food Chemistry, vol. 56, no. 16, pp. 7305-7310. Iino, T., Nakahara, K., Miki, W., Kiso, Y., Ogawa, Y., Kato, S. & Takeuchi, K. 2001, “Less damaging effect of whisky in rat stomachs in comparison with pure ethanol – Role of ellagic acid, the nonalcoholic component“, Digestion, vol. 64, no. 4, pp. 214-221. “BACKGROUND/AIM: Ellagic acid (EA), one of the polyphenols that are abundantly contained in whisky as a nonalcoholic component, has antioxidant and anti-inflammatory activities. In the present study, we compared the action of whisky and pure ethanol on the rat gastric mucosa, and examined the role of EA in the less-damaging effect of whisky in the stomach. METHODS: Under urethane anesthesia, a rat stomach was mounted in an ex vivo chamber, perfused with saline, and the transmucosal potential difference (PD) was measured before and after exposure to whisky (Yamazaki, Suntory) and ethanol (43%). 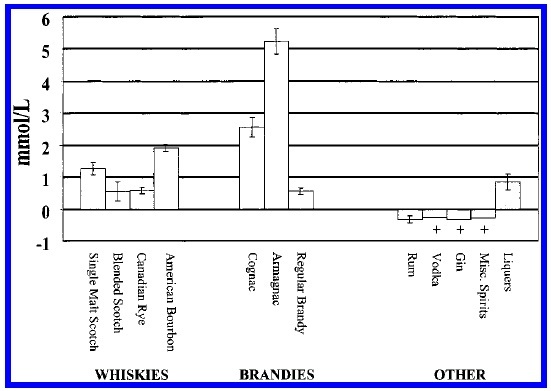 In a separate study, the animals were given whisky or ethanol (1 ml, 43%) p.o. under unanesthetized conditions, killed 1 h later, and the gastric mucosa was examined for hemorrhagic lesions. RESULTS: Both whisky and ethanol caused a PD reduction, resulting in damage in the stomach, but these responses were less marked in the case of whisky. Although the reduced PD recovered gradually after removal of ethanol, this process was significantly expedited by co-application of EA (80 microg/ml), the recovery rate being much the same as that observed after exposure to whisky. The less-damaging effect of whisky was confirmed in unanesthetized rats after p.o. administration of these agents. In addition, EA (1-30 mg/kg), administered p.o. together with absolute ethanol (99.9%), reduced the severity of gastric lesions induced by ethanol, in a dose-dependent manner, and the effect at 30 mg/kg was equivalent to that obtained by the whisky component containing several low- and high-molecular-weight polyphenols. EA had a scavenging action against both oxygen and hydroxyl radicals in vitro, the effect being equivalent to that of catechol or alpha-tocopherol. Iino, T., Tashima, K., Umeda, M., Ogawa, Y., Takeeda, M., Takata, K. & Takeuchi, K. 2002, “Effect of ellagic acid on gastric damage induced in ischemic rat stomachs following ammonia or reperfusion“, Life Sciences, vol. 70, no. 10, pp. 1139-1150. Itoh, T., Ando, M., Tsukamasa, Y., Wakimoto, T. & Nukaya, H. 2012, “Whiskey Congeners Suppress LPS/IFN gamma-Induced NO Production in Murine Macrophage RAW 264 Cells by Inducing Heme Oxygenase-1 Expression“, Journal of Agricultural and Food Chemistry, vol. 60, no. 51, pp. 12491-12500. Whiskey includes many nonvolatile substances (whiskey congeners; Whc) that seep from the oak cask during the maturation process. To date, many functions of Whc have reported, such as antiallergy and antimelanogenesis. This study examined the effect of Whc on LPS/IFNγ-induced nitric oxide (NO) production in murine macrophage RAW 264 cells. Whc suppressed LPS/IFNγ-induced NO production in a concentration-dependent manner. To determine the active compounds in Whc, the effect of 10 major compounds isolated from Whc on LPS/IFNγ-induced NO production was examined. Coniferylaldehyde (CA) and sinapylaldehyde (SiA) strongly suppressed LPS/IFNγ-induced NO production. Pretreatment with Whc, CA, and SiA induced heme oxygenase-1 (HO-1) expression. The expression of HO-1 by Whc, CA, and SiA pretreatment was due to activation of Nrf2/ARE signaling via the elevation of intracellular reactive oxygen species. To investigate the in vivo effects of Whc, Whc was administered to mice with antitype II collagen antibody-induced arthritis, and we the arthritis score and hind paw volume were measured. Administration of Whc remarkably suppressed the arthritis score and hind paw volume. Taken together, these findings suggest that Whc is beneficial for the treatment of inflammatory disease. Itoh, T., Tsukane, M., Koike, M., Nakamura, C., Ohguchi, K., Ito, M., Akao, Y., Koshimizu, S., Nozawa, Y., Wakimoto, T., Nukaya, H. & Suwa, Y. 2010, “Inhibitory Effects of Whisky Congeners on IgE-Mediated Degranulation in Rat Basophilic Leukemia RBL-2H3 Cells and Passive Cutaneous Anaphylaxis Reaction in Mice“, Journal of Agricultural and Food Chemistry, vol. 58, no. 12, pp. 7149-7157. Koga, K., Taguchi, A., Koshimizu, S., Suwa, Y., Yamada, Y., Shirasaka, N. & Yoshizumi, H. 2007, “Reactive oxygen scavenging activity of matured whiskey and its active polyphenols“, Journal of Food Science, vol. 72, no. 3, pp. S212-S217. Lu, Y., Nakanishi, T., Fukazawa, M. & Tamai, I. 2014, “How Does Whisky Lower Serum Urate Level?”, Phytotherapy Research, vol. 28, no. 5, pp. 788-790. Nishioka, K., Sumida, T., Iwatani, M., Kusumoto, A., Ishikura, Y., Hatanaka, H., Yomo, H., Kohda, H., Ashikari, T., Shibano, Y. & Suwa, Y. 2002, “Influence of moderate drinking on purine and carbohydrate metabolism“, Alcoholism-Clinical and Experimental Research, vol. 26, no. 8, pp. 20S-25S. BACKGROUND: We examined the influences of a moderate intake level of three types of alcoholic beverages–beer, whisky, and Shochu (Japanese distilled liquor)–on purine and carbohydrate metabolism and excretion in healthy male volunteers, concerning (1) the extent of contribution of purine bodies contained in beer to uric acid metabolism and (2) a comparison between two types of distilled spirits with (whisky) and without (Shochu) aging in oak wood barrel storage. METHODS: Three sets of studies were conducted in which 10 to 13 healthy adult men were instructed to drink three types of alcoholic beverages at a slightly higher level (0.8 ml of ethanol equivalent/kg body weight) than moderate drinking (approximately 30.4 ml or less for men). A low purine beer was test-manufactured by treating nucleosides that were contained in wort and remained in beer with purine nucleoside phosphorylase derived from Ochrobacterium anthropi, thereby converting them into corresponding purine bases that were easily assimilated by beer yeast. RESULTS: Although beer intake enhanced the level of serum uric acid by 13.6%, blood glucose by 26.7%, and insulin level by 5.1-fold, drinking a moderate level of distilled liquor (whisky, Shochu) did not increase the serum uric acid level or the other two parameters. The serum uric acid level observed after drinking beer with a purine body concentration reduced by 28% (68% in nucleosides and purine bases) was almost identical to the level observed after drinking regular beer. Whisky has been found to have a property that decreases the serum uric acid level. Excretion of uric acid from blood is increased by 27% after drinking whisky. Suzuki, K., Nemoto, A., Tanaka, I., Koshimizu, S., Suwa, Y. & Ishihara, H. 2010, “Induction of Heme Oxygenase-1 by Whisky Congeners in Human Endothelial Cells“, Journal of Food Science, vol. 75, no. 6, pp. H163-H166. Tanaka, T., Matsuo, Y. & Kouno, I. 2010, “Chemistry of Secondary Polyphenols Produced during Processing of Tea and Selected Foods“, International Journal of Molecular Sciences, vol. 11, no. 1, pp. 14-40. Yao, R., Yasuoka, A., Kamei, A., Ushiama, S., Kitagawa, Y., Rogi, T., Shibata, H., Abe, K. & Misaka, T. 2014, “Nuclear Receptor-Mediated Alleviation of Alcoholic Fatty Liver by Polyphenols Contained in Alcoholic Beverages“, Plos One, vol. 9, no. 2, pp. e87142. I have wanted to try brewing something for sometime, and as both mead and honey are particular interests of mine, mead seemed the obvious thing to try for myself. However, the usual methods employed to brew mead at home require at a minimum certain brewing equipment that I currently lack. Standard methods include sterilizing the honey and water used, adding a specific brewing yeast, and carrying out the fermentation in a specialised brewing vessel fitted with an air lock. Lacking any of these, and inspired by The Art of Fermentation by Sandor Katz, I decided to try a different approach using the wild yeasts naturally found in honey. I am also rather curious as to how people in ancient times produced their mead, after all it was mostly likely one of the first alcoholic beverages, and they surely had a certain lack of specialised brewing equipment. While honey itself is remarkably resistant to microbial action, this property is dependent on the water content remaining low, and as soon as the honey is diluted with water the dormant wilds present in the honey reawaken and soon get to work converting the honey sugar into alcohol. This of course depends on the honey still being in a raw state and not heat treated during its processing. 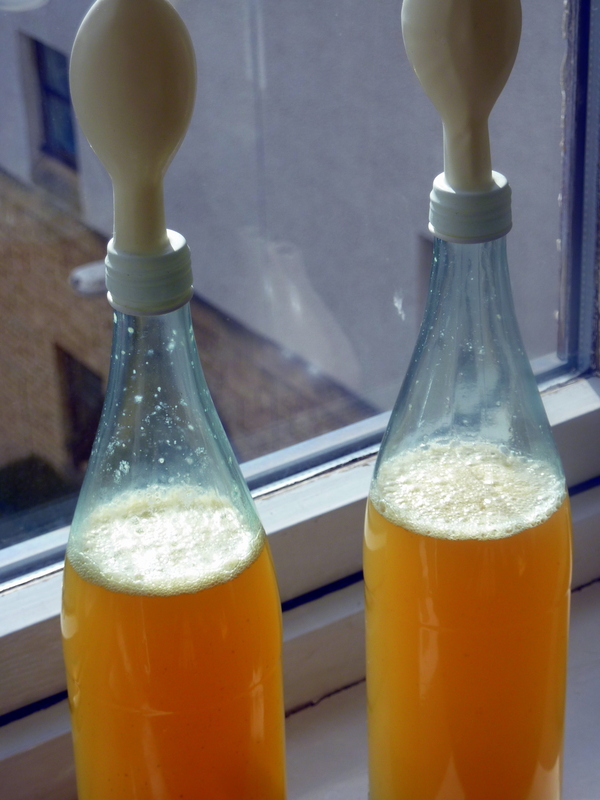 The random selection of wild yeast strains and other assorted bacteria present in unheated honey naturally make this rather a shot in the dark in terms of how the resulting mead may turn out. But as I only wish to make a small amount there seems little loss for me to give it a try. In his book Sandor recommends a ratio of four parts water to one part honey as a good starting point. Looking for a good honey to use I decided on the Organic Forest Honey from Zambia as this should not have been heat treated and also happens to be the cheapest raw honey available to me for an initial experiment. Dissolving a 250 ml jars worth of honey into 1 L of water took some time and a quite a lot of stirring. When eventually dissolved I put it into a couple of glass Acqua Panna mineral water bottles for the brewing. As I bought bottles for the purpose the mineral water was using to make the mead. A party balloon with a pinprick hole in the top makes a very simple airlock, allowing any pressure inside to escape while keeping air out. It took a few days of shaking the honey and water up each day before the yeast seemed to become active but now liquid has been bubbling away well for about a week with the balloons on top inflated with carbon dioxide from the fermentation. I have read that this initial fermentation will continue for a a couple of weeks during which time all the glucose in the honey is rapidly fermented. When that slows down the mead can then be bottled where it continues to slowing ferment the remaining fructose becoming drier and less sweet with increased aging. While the outcome cannot be predicted, I await the results with hopeful expectations. It will be interesting to see the results of those yeasts so recently inhabiting the wild Zambian forests. A relatively recent addition to our British shops, and once restricted to health food shops, it now seems that pink Himalayan salt can be found almost everywhere even appearing in major supermarkets. A quick browse of the topic of Himalayan salt online quickly reveals a plethora of wild health claims related to these rather attractive pink salt crystals. Curious as to where this product had so suddenly appeared from in recent years I started to look into the subject online but was dissatisfied to find the information available disappointingly repetitive without any reputable sources provided. For a start this salt does not come from the Himalayas mountains but instead from a few hundred miles south in the mountains of Pakistan. While the Khewra salt mine from which the pink salt originates is an interesting subject in itself, the term Himalayan Salt was clearly a stroke of marketing genius. The story of the appearance of Himalayan salt as a health food in Europe seems to have begun in Germany with a man name Peter Ferreira, whose real name seems to be Peter Druf according to this sceptic website and has it seems been called by some the “König der Scharlatane” or king of charlatans. Apparently still selling Himalayan salt, as his biography on this site suggests, he claims to be a Biophysicist although no proof of this is forthcoming. His rise to prominence began it seems in late 1990’s Germany with public lectures and tape recordings claiming this Himalayan salt to be a panacea for all ills. Although I cannot speak German, recordings of some of these have been posed on youtube including this audience exhausting five hour monologue. Further prominence in Europe was achieved with the release of the book Water and Salt: The Essence of Life – The Healing Power of Nature that details “the powerful healing qualities of Himalayan Crystal Salt” co-authored with a Dr Barbara Hendel who is apparently still working as some sort of holistic medicine doctor in Germany. While there are plenty of rather wacky language used in relation to this salt many of the claims rest on its mineral content, as it is reputed to contain 84 minerals. The details of its mineral composition that are widely quoted are shown here, although the site itself is not making any wild claims, the table is reproduced from the Peter Ferreira’s book Water and Salt. Some investigation uncovered that the source of this detailed analysis is an Institute of Biophysical Research, Las Vegas USA, which it seems Peter Ferreira is the director of and appears to exist in name only. As Ferreira was also the owner of the main company selling this salt at the time it makes me wonder who carried out the analysis or whether is was just made up from Ferreira’s imagination. According to wikipedia a German TV show tested some Himalayan salt available for sale in that country and only found 10 minerals other than sodium chloride were detectable, although sadly this information does not seem to be available online anywhere. Looking more closely at the reputed 84 minerals it is clear that the table is laid out in a way that can easily mislead the unwary, as it clearly has done. For example this site which states “The Easy Way To Sneak 84 Minerals Into Your Diet Daily“, with a copy of the pages from the book helpfully included at the bottom of the page. In fact when the table lists the salt as containing <0.001 ppm of boron this means that the test used could not detect any boron within the limits of the test. As scientific tests usually have a lower limit of detection when nothing is measured the results are presented as “less than” the detection limit, as such a test cannot prove that none is present. So 53 of the elements in the table were not detected in the salt. Many of those elements that were detected were present in such absolutely tiny amounts as could be found as contamination in almost anything you might test. After searching for some independent testing I found a recent study published in the Journal of The Chemical Society of Pakistan that investigated the mineral and trace element content of a range of different coloured salt samples from the Khewra salt mine. The main constituents are shown in Table 1 below and this clearly shows that sodium and chloride were the main mineral in all the samples, whatever the colour, making up between 97.55% and 98.3% of the salt. Small amounts of calcium, magnesium, sulphate, and potassium were also detected although as these each formed less than 1% of the Khewra salt they are probably of no nutritional significance. The same paper analysed the trace element content of the salt for iron (Fe), zinc (Zn), copper (Cu), manganese (Mn), chromium (Cr), lead (Pb), and cadmium (Cd). Reassuringly the levels of toxic metals like lead and cadmium were very low or undetectable. Iron was found which is to be expected as it is iron oxide that gives the salt its distinctive pink colour. However at less than 1 mg/kg of salt the quantities of iron in the salt are exceedingly small and of no relevance to our human health. To put it into perspective according to this study a 6 gram teaspoonful of this salt would contain at most 6 mcg or iron, compared to 150 mcg or iron is a small raw carrot. The other trace elements measured were also found in extremely small amounts. These results would agree with the reported ten minerals that were detected in samples of salt tested in Germany. Another study I came across published in the Journal of Sensory Studies looked at many different salts from around the world also included Himalayan salt in their analysis. Their analysis of Himalayan salt found similar levels of calcium, potassium and sodium and slightly higher levels of zinc. This analysis found higher levels of iron in the salt, reported to be 39 mcg/g, which is a lot more than the previous study and so perhaps there is quite a lot of variety between different batches of salt. However, this would still only equate to 235 mcg in a teaspoon of salt. In summary “Himalayan” rock salt contains mostly sodium chloride with a small amount of magnesium and calcium as found in most unrefined salt. Any other trace elements it contains are in really tiny amounts, which is a good thing as many of those like lead would not be desirable in any larger quantities. I don’t see anything wrong with using some of this salt as its colour is quite attractive though it may not really be worth the prices that are often charged for it. However, the origin of its rise to prominence in Europe is really rather dubious and any health claims surrounding it are deeply suspect. I think it unlikely to have any effect on my health beyond any other type of unrefined salt. What interested me more after looking into the origin of this salt is the mines in Khewra salt mine from which it originates. Apparently in use for more than two thousand years the workers of the mine have used blocks of the many hued salt to construct beautiful underground constructions including the tiny mosque in the photo below.